Time for this week's edition of "Lazy Girl's guide..." Your weekly guide to cutting beauty corners without scrimping on impact. This week's topic: Body Moisturiser. I'm sure I'm not alone in saying this is my least favourite part of a beauty routine. I absolutely hate standing around waiting for heavy body creams to sink in and detest the feeling of being slathered in something sticky and gloopy. While all these body butters and creams tend to smell good enough to eat. I just don't enjoy using them. I know for a fact that I don't moisturise the body as much as I should do. I'll regret this as I get older, so now is the time to act. Especially as the weather is changing my body is getting drier, and my skin is looking a little rough round the edges. Two products have wormed their way into my life and have cut down the faff of body moisturising. While they aren't as rich as some other body creams or butters, they do the job just fine and leave the skin feeling moisturised and soft. First up is the Nivea In Shower Body Moisturiser Skin Conditioner. It's a thick body lotion with a hair conditioner type feel to it that is designed to be used in the shower. I like this because it fits easily into a quick shower routine. After cleansing with a shower gel you apply it all over the body and then wash straight off. It leaves skin feeling silky soft straight out the shower without the need to apply additional cream. I adore the scent of this as well, it's very almond-y which is a really lovely clean scent. 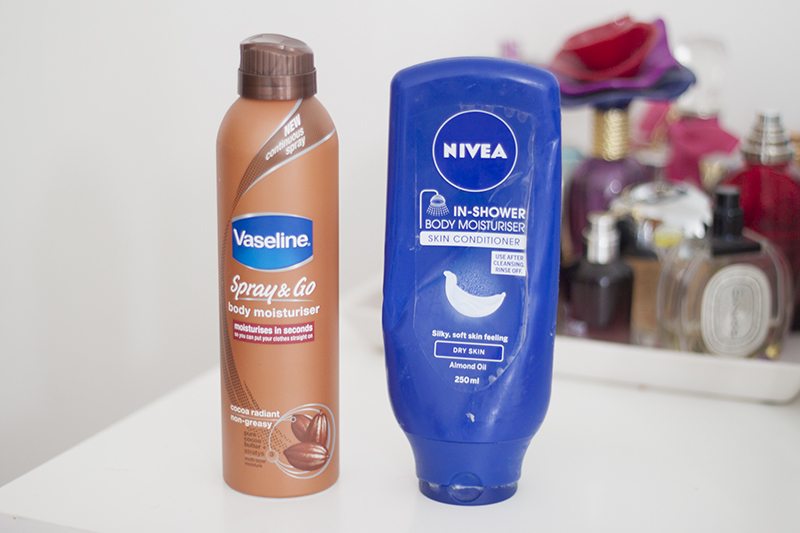 The Vaseline Spray and Go Body Moisturiser is another non-greasy moisturising quickie. As the name suggests its a spray and go moisturiser which dries in seconds, All you do is mist your body with the continuous spray can and then pop your clothes straight on. The body moisturiser absorbs into the skin in seconds without the need to rub in. It comes in three scents Original, Aloe and Cocoa, I chose Cocoa as I adore the fresh almost creamy scent of cocoa butter. I like to pop this on my legs before night's out to stop my knee's looking ashy and give my skin a bit of a sheen.